While today the issue is whether there is a Toronto Condo bubble or not, in a decade or two I suspect there will be another issue: what to do with all those glass condos. Having floor to ceiling windows may have its perks, such as beautiful views of the building next door and better light penetration coming from headlights on the Gardiner... however, having glass walls come at a cost of being inferior compared to traditional masonry walls. If double glazed curtain walls are inferior to masonry walls, why do developers choose to build them? Simply because of the price. Let me get this straight - new condos prices are at all time highs, and that alone is not enough profit for developers, so they decided to use cheapest materials possible in order to make even more money. And if the people start asking questions why does every new tower have a glass skin, developers simply say that it is what the market demands. The sad part is that when those glass skinned buildings fail, it will be the owners who would inherit the repair costs. Kesik, an authority on retrofitting older buildings, also says you can’t just tear them down and start over because, as experts agree, the concrete structures underneath these blue-green glass exteriors are built to last. “I have always maintained that, when you’re looking at those glass towers there, you’re basically looking at the slums of the future,” insists Kesik. “No one will want to buy them because people will look at them and say, ‘Are you crazy? I don’t want to buy something that leaks, that will cost a fortune to retrofit.’ So when they can’t get sold, they’ll get rented. And they’re not of a high quality, so they can’t get rented for a lot of money. So who do you think is going to live there? I tell people, this is where your grandchildren are going to come to buy crack. 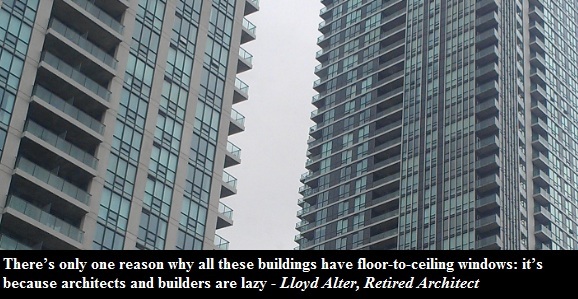 The masonry apartment buildings that were build in the 70s may look ugly today, but they are much more efficient. A masonry wall will have a thermal resistance of about 70% while a double glazed curtain wall will have a thermal resistance of about 6%. Below I recreated a chart originally produced by Dr. Joseph Lstiburek who showed how our society came a full circle in a millennium when it comes to thermal resistance. 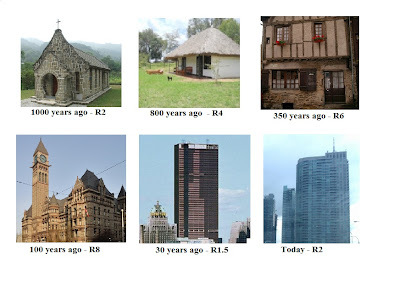 In the picture below, the higher the "R" value, the better the thermal resistance of the building. Finally, in case you missed it, sometime ago CBC ran a series of reports on Toronto's glass condos. I recommend you watch them, part 1, part 2, part 3. Yet, not everyone agrees with CBC's view point that in 10 to 15 years Toronto's glass condos will require extensive repairs. There is a case that glazed curtain walled condos could last up to 35 years before you start seeing any kind of failure in windows. Additionally, some say that it is not necessarily the glass walls that are the issue per se, but the quality of their manufacturing and installation. How will this all play out, only time will tell.